Excellent compilation of material covering 1965 to 1977. 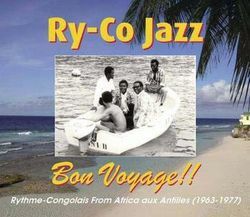 The band had a core line up of the amazing Jerry Malekani on guitar, Freddie Nkounkou and Mbilia Casino on vocals plus in the earlier days Panda Gracia on bass and then, once they moved onto the French Caribbean, Jean Serge Essous on sax. The music was groundbreaking as they mixed many styles including rumba and soukous and then calypso and reggae. This of course was glorious music for the dance floor and this collection comes highly recommended.